With Cobb temporarily relegated to the background due to a protracted slump that saw him hitting under .300 as late as June 2, and then by being sidelined for a month after colliding with teammate Ira Flagstead in pursuit of a fly ball, the St. Louis Browns first baseman had emerged from Cobb’s shadow as arguably baseball’s premier hitter. The 27-year-old Sisler, now in his sixth campaign with the Browns, had hit better than .300 all but his rookie season, and above .340 for the past three years, but was finally capturing national attention by seizing a place at or near the front of the batting race since Opening Day. On June 14 Sisler passed the .400 mark and kept on going, reaching as high as .434 on June 28. Although his average dipped into the .390s in late July, on the morning of August 5 Sisler, having hit safely in 10 straight games, was in second place among the AL leaders at .403, just ahead of Chicago’s Shoeless Joe Jackson at .397, and Yankees slugger Babe Ruth at .392. Topping them all was Tris Speaker, the veteran leader of the Cleveland Indians, whose torrid hitting in June and July had pushed his average to a phenomenal .421. With the Browns stuck in a distant fifth place at 47-51, far behind the contending Indians, Yankees, and White Sox, the attention of St. Louis fans was focused primarily on Sisler and his progress at the plate as the Washington Nationals, a half-game up on the Browns at 46-49, arrived in town on August 5 for a four-game series. The Browns won the first two games, 2-1 and 14-7, with Sisler collecting three hits in nine at-bats, extending his hitting streak to 12 games. After a scheduled day off, the clubs met again for a Sunday doubleheader. The Browns took the opener, 3-2, in the ninth on a double by Earl Smith, a wild throw by center fielder Sam Rice that allowed Smith to take third, and a single by Jack Tobin. Sisler smacked two hits, a single and a double, in four at-bats. A pair of right-handers, Elam Vangilder (2-5) for the Browns and Eric Erickson (10-9) for the Nationals, started on the mound for the second game. Washington was the first to score, tallying a pair of runs in the third inning. After Patsy Gharrity walked and Erickson bunted him to second, Joe Judge singled to center, scoring Gharrity. Judge was subsequently called out stealing second on a contested call that loomed larger when the following hitter, Clyde Milan, hit only the 15th home run of his of his 14-year career into the right-field stands for a 2-0 lead. St. Louis took its revenge in the bottom of the third when Joe Gedeon walked and Sisler, who tallied a single in the first inning, doubled to right center, advancing Gedeon to third. Baby Doll Jacobson drove Gedeon and Sisler home with a game-tying double. Erickson bobbled Ken Williams’s smash back to the mound and then threw the ball away, allowing Jacobson to score and Williams to take second. Smith flied to center, but Tobin singled to right, scoring Williams to put the Browns up 4-2. Bucky Harris’s double to left, an infield single by Howard Shanks, and a sacrifice fly by Jim O’Neill gave the Nationals a third run in the fourth inning but a great defensive play possibly prevented further damage. Shanks stole second and Gharrity reached base on an error by Smith at third. Erickson hit a grounder past Vangilder, but second baseman Gedeon grabbed the ball in back of second, tumbled, and threw the pitcher out at first from a sitting position. Sisler belted his 14th home run of the season with Gedeon on base in the bottom of the fourth, giving the Browns a 6-3 lead. St. Louis skipper Jimmy Burke, who had pulled Vangilder for a pinch-hitter in the fourth inning, brought in right-hander Bill Burwell to pitch. Although Burwell allowed a single to Milan and hit Braggo Roth with a pitch, the Nats failed to score in the fifth. Gharrity came close to a homer in the sixth when his long drive to left caromed off the wall inches short of going over. Williams snared the ball on the rebound to hold Gharrity to a double. Ericksen left Gharrity stranded when he tapped back to the mound for the third out. A single by Wally Gerber and a walk to Gedeon put two runners on as Sisler came to the plate in the bottom of the sixth. Sisler, who had singled in the first, doubled in the third, and homered in the fourth, hit a low liner to center which bounced off Rice’s shins and rolled to the wall. Both Gerber and Gedeon scampered home and Sisler pulled into third with a triple, giving him a cycle for the game. Sisler attempted to score when Williams was thrown out at first on a grounder to Harris at second, but was tagged out at the plate on the relay from Judge to catcher Gharrity. Judge hit a solo homer in the seventh to cut the St. Louis lead to 8-4, but the Browns retaliated in the bottom of the frame with a triple by Josh Billings and a single by Burwell. Two batters later, Sisler, hitting for the fifth time in the game, came to the plate with the bases full but went down swinging. St. Louis added two more in the eighth. Jacobson and Williams singled. After Jacobson was picked off second by Gharrity, Smith poked a base hit to center, with Williams scoring on an errant throw to the infield, his second of the afternoon, by Rice. Tobin’s sacrifice fly brought Smith home to make the score 11-4. Burwell set the Nationals down in the ninth, giving the Browns a sweep of the doubleheader and the four-game series, and evening their record for the season at 51-51. 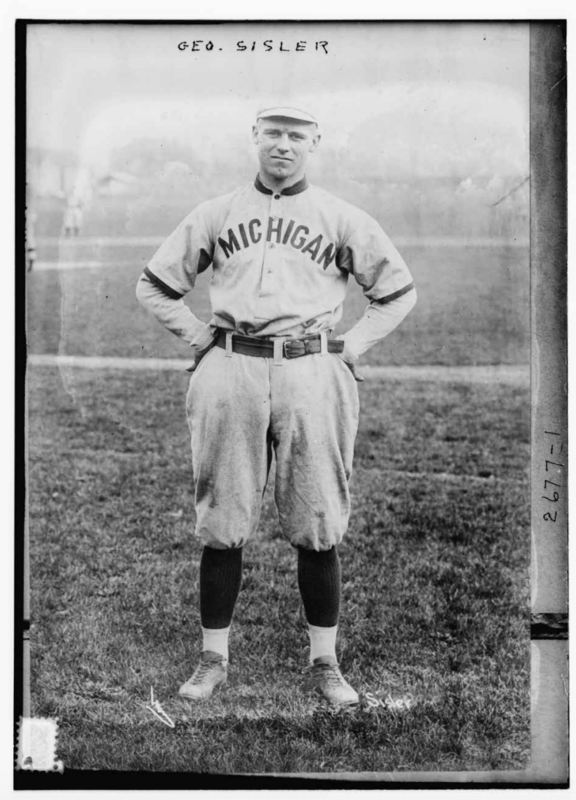 George Sisler’s 6-for-9 day at the plate raised his batting average to .407, the same average with which he would win the batting title at season’s end. His hitting streak, standing now at 14 games, would extend to 25 games before it was stopped by Philadelphia’s Scott Perry on August 24. Sisler, the first Browns player to hit for the cycle, would duplicate the feat almost a year to the day later, on August 13, 1921, against the Detroit Tigers, in the Motor City. In addition to the sources listed in the notes, the author also consulted the New York Times, St. Louis Post-Dispatch, St. Louis Star-Times, The Sporting News, and Washington Post. 1 Dean Snyder, “Sisler Heralded as the New Ty Cobb,” Fitchburg (Massachusetts) Sentinel, August 9, 1920: 6. 2 Jack Nye, “Double Defeat Handed Griffmen Gives Browns Clean Sweep of Series,” Washington Herald, August 9, 1920: 8.